The Japanese space agency JAXA analyzed the data collected on its Hitomi Space Telescope, formerly known as Astro-H, to try to understand the reasons why only sporadic signals got received from the satellite since March 26. The most plausible hypothesis is that it lost its attitude because of some invalid data and its maneuvering thrusters didn’t correct the problem due to unsuitable settings. The perspective is grim but there are still hopes to save Hitomi. The launch of the Astro-H Space Telescope that took place on February 17, 2016 was successful and, in the Japanese tradition, at that point it was named Hitomi, which in Japanese means “eye” or “pupil”. The tests seemed to be going well until March 26, when one of the programmed contacts resulted in silence from the satellite. The connection attempts have only obtained some signals in the following days and observations from the ground noticed the presence of five pieces of debris separate from Hitomi, certainly not a positive signal. JAXA engineers were able to use only the telemetry data available, the ones previous to its silence, to try to understand what happened to the space telescope. According to the reconstruction, on March 25 one of Hitomi’s on-board systems, the Inertial Reference Unit (IRU), detected a non-existent spacecraft roll. In the absence of other satellite attitude data, the system attempted to compensate for the roll using its reaction wheels as well with the result that it started spinning. After reaching the reaction wheels’ saturation, Hitomi switched to the so-called “safe mode”, in which it’s programmed to use its Sun Sensor to determine its position and restore its attitude. Something went wrong and its maneuvering thrusters were activated, increasing Hitomi’s spinning. For JAXA’s engineers, those events suggest that some systems weren’t programmed correctly and the result was a chain of events that worsened Hitomi’s situation instead of bringing it back to normal. Among the debris there may be pieces of solar panels and this is a further problem because for Hitomi it’s become even more difficult to draw energy and its on-board batteries are probably out of energy. JAXA and NASA, which provided one of Hitomi’s instruments, made some observations before communications got interrupted. However, those were some of the instruments calibration tests, very little compared to a mission scheduled to last at least three years with possible extensions. 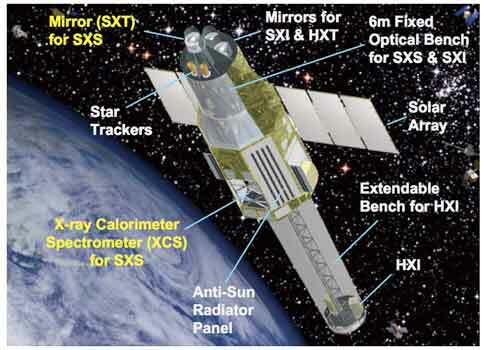 If Hitomi’s mission were to fail, it would be a blow to JAXA and generally to X-ray astronomy because especially the Soft X-ray Spectrometer (SXS) was built as part of a technological development that’s supposed to lead to progress in this field. If it’s impossible to use this instrument probably this progress will suffer years of delays. JAXA hasn’t given up hope of recovering at least partially its Hitomi Space Telescope but the situation is really bad. All possible efforts will be made to resume communications with Hitomi and, if successful, an analysis will be made of the damage and the possibility of using any working instruments. Best-case scenario, it will take months of planning, attempts, analysis and whatever is necessary but JAXA will try anything before declaring the mission failure.